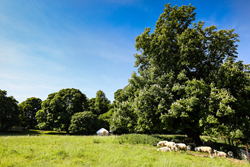 Why ecotourism is a key element of the Rock Farm Slane project. We have just recently launched an ecotourism business at Rock Farm Slane offering back-to-nature camping holidays in luxury yurts & shepherds’ huts. Last Sunday I was asked to go on Today FM’s Sunday Business Show with Conall O’Morain to talk about ecotourism. As the business hasn’t been running for long and in preparation for the radio interview I focused my thoughts on what ecotourism is for me on a personal level. In my own words, ecotourism is tourism that takes account of the environment, local habitats and culture to maintain and improve communities and natural landscapes that are also of tourism interest. “Tourism envisaged as leading to management of all resources in such a way that economic, social and aesthetic needs can be fulfilled with maintaining cultural integrity, essential ecological processes, biological diversity, and life support systems”.This is a tall order for a small business, but it is achievable. It’s just a question of embracing the complexity of the requirements and boiling them down to a few simple terms. The ecologist Eric Berlow does this very succinctly in his TED Talk on ‘Simplifying Complexity’. In many cases, in the developed world, rural resettlement and rural tourism come hand in hand and rural tourism is an opportune platform for ecotourism. The economic boom brought a diverse range of people out to Slane, a small country village in Co Meath. However, despite difficult beginnings, the financial crisis has brought together a critical mass of like-minded individuals (new and old members of the community) interested in promoting the sustainability of this heritage village, as well as country life, local food, entertainment, arts & craft. This organic movement centred around existing structures is leading us in the direction of a Transition Town without anyone yet vocalising that that is where we are going.Having studied both environmental management and permaculture design, I like to boil complex criteria down to simple terms and find Permaculture principles one of the best approaches to do so. A good example is deciphering the GSTC criteria above for sustainable tourism using 3 simple terms introduced by the Permaculture movement in the late 1970s: earthcare, peoplecare and fair share. Theseterms were developed for sustainable agricultural management and the establishment of sustainable communities. But they are also useful as tools for understanding the founding principles of ecotourism. Organic farming and sustainable land management protects surrounding ecological habitats and water courses, by refraining from the use of chemicals as part of the farming system. Natural sewage systems: compost toilets, reed beds and integrated constructed wetlands (ICW) that protect water courses by firstly separating human excrement from the local foul waste systems. The grey water can then be filtered and polished using mechanical filters or natural media like sand before allowing the final stage of treatment in an additional new ecologically beneficial habitats (e.g. a planted reed bed or ICW).Rainwater harvesting & grey water recycling: reduces the amount of water required from municipal sources and thus reduces pressure on groundwater, which can take years to replenish, as well as rivers, lakes and springs. This kind of improved water management will also allow humans to mitigate the effects of extreme climatic events such as droughts on our farms, towns, cities and the countryside in general. Peoplecare: Without wanting to sound cold and uncaring, our concern for climate change and the repercussions of environmental damage is centred upon the reality that our way of life is the most likely to be affected. So in a sense, our interest in earthcare stems from peoplecare and the viable continuation of the human species. The importance of avoiding the disenfranchisement of local people in ecotourism, by including them in rehabilitation programmes and eco-friendly initiatives, is as important in Ireland as it is in the Congo and the Amazon. That’s why community-based projects like Tidy Towns, Pride of Place, GIY Ireland (Grow It Yourself Ireland), the Transition Towns’ movement and the National School’s Green Flag scheme are so important to the development of rural tourism as well as improving the environment and our own social infrastructures. Lest we forget, tourists come to Ireland for two main reasons: the landscape and the people; and it’s the people that they remember, because their hospitality and sociability make the stay so special. Fair share: is a call to action for the redistribution of surplus to all who need it. However it also makes sense where there is a deficit of free resources: money, labour, energy etc when everyone’s contribution however small has a use. This is something which is relatively new to Ireland, after years of prosperity, but it is showing to be a positive change especially in our local farming community. Cooperative food marketing by local food groups like the Oriel Food Group and the Slane Food Circle is an interesting example of mutually beneficial collaboration.Likewise, volunteer hosting and volunteering on labour-intensive projects are as imporant in ecotourism as they are in permaculture.Since joining the organic farming scheme with The Organic Trust, we have been dependent on volunteers’ support through WWOOF Ireland and other volunteering organisations. We have now begun to use that same volunteer force to help build our strawbale buildings which will serve as a farm office, farm house and residential/communal building for the campsite and ecotourism /educational activities. These natural building techniques require more manual labour than a standardised commercial building project, as they are less dependent on automation, machinery and manufactured materials. So as an ecotourism offering we are able to provide local volunteers and foreign travellers a taste of our back to natural experience as well as experience in natural building techniques, a share of our farm produce and a beautiful area for camping over the summer months. On a personal level the relative sense of abundance at seeing people enjoy the amenities of our farm (the walks, the river, the glorious views of Slane Castle and the Boyne Valley and our nascent permaculture projects) allow us to enjoy the experience again and again through new eyes.